Being from the south, coconut is one ingredient that we tend to add in most of our dishes. 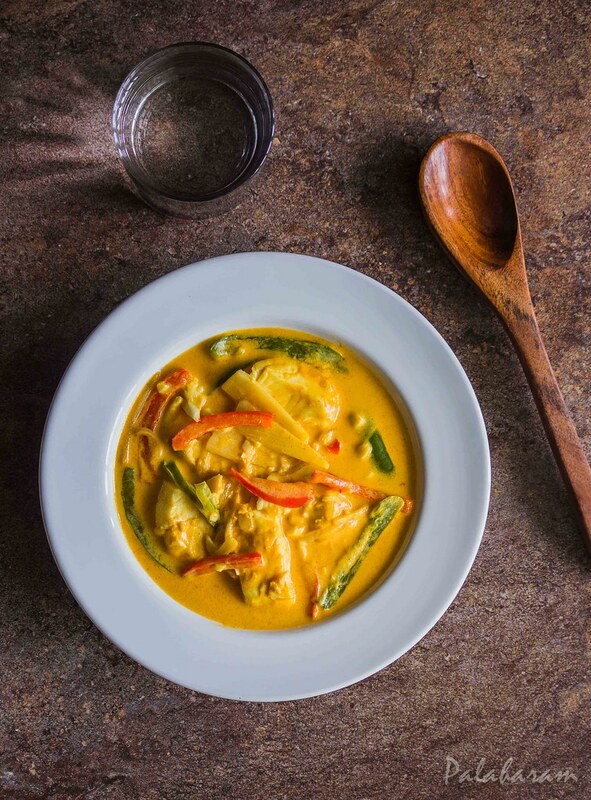 While trying different cuisine, we have felt that, thai dishes have a very close resemblance to the dishes that we make every other day and also is being appreciated by our taste buds. 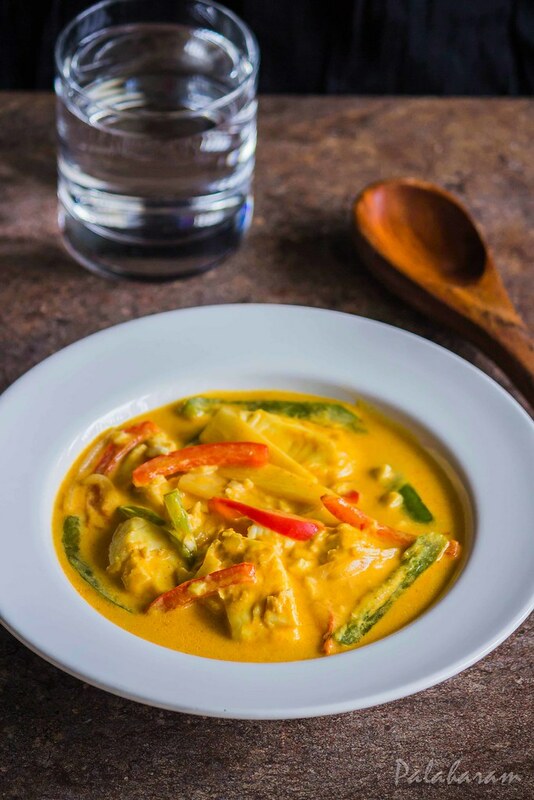 This thai curry is just the perfect dish to make on a busy weekday when you might want to just spend the least time in the kitchen but would be craving to want a restaurant style dinner. 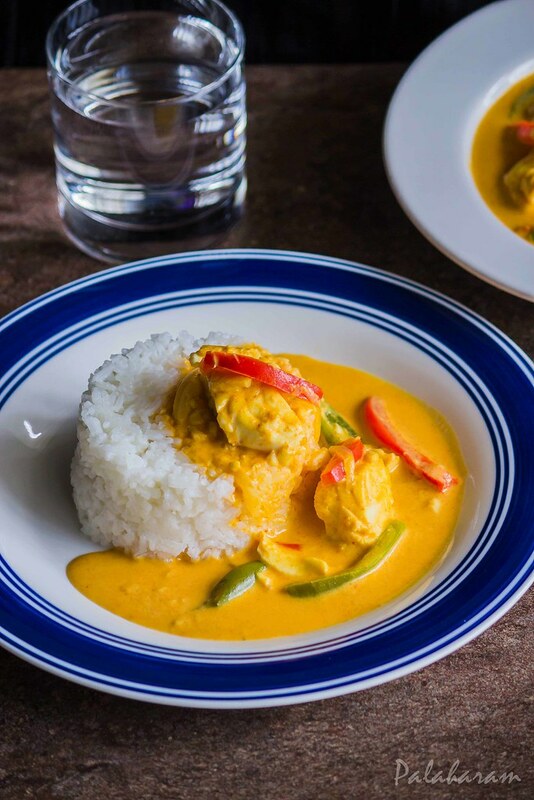 It may sound impossible but this curry is so simple to put together that, in just 30 minutes, you would have made the most amazing dinner for your family which would taste so delicious that it may look like as if you slogged in the kitchen to put it together and who wouldn't love to be appreciated for the end result where you would've just put in the least effort :P. So here's the recipe that I follow to have a easy peasy thai curry. In a pan, take the oil. Once hot, add the sliced onion and green chillies. Sprinkle some salt and saute it for a minute. Add the red and green bell peppers and saute it again for a minute or two on medium heat. Remove it all on to a plate and keep it aside. Into the same pan, add 1/2 cup of coconut milk. To it add the curry paste and mix it well. Cook it on medium heat untill the mik reduces and looks more like a paste or gets to a peanut butter consistency. At this point, add the turmeric and rest of coconut milk. Stir it to mix the curry paste. Once the coconut milk gets warm, add the brown sugar, sprinkle pepper and salt. Mix it well. Add the fish pieces, bamboo shoots and chest nut and let it cook for about 3-4 minutes. Add the cooked onion and bell peppers and mix it well. Let it cook for another minute. Adjust salt and pepper. 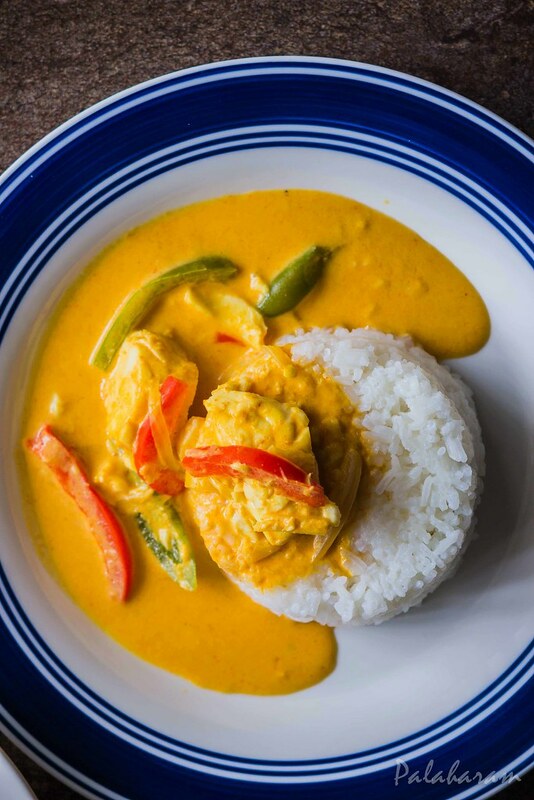 By now, the coconut milk would have reduced and thickened a little and the fish would have cooked too. Garnish it with some sliced red thai chillies. Serve it warm with some steaming jasmine rice. Yum! While slicing yellow onion and bell pepper, do not slice them thin. Keep it a little thick. You could use multiple colours of bell peppers, baby corn etc. in this dish as an alternative to other veggies and fish. Do not saute the veggies for too long else they would loose the crunchiness. The curry tastes good when the veggies are a little crisp and crunchy. Sauting it before adding it to the curry is optional. You could add it directly to the curry and cook it. I feel sauting it a bit adds to the taste of the curry. 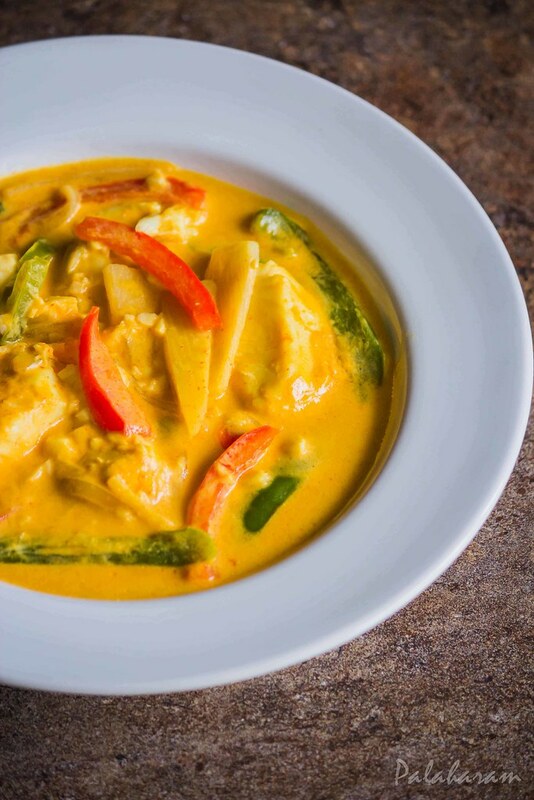 Reduction of the coconut milk is a very important part of making this curry, so do not skip it.